THANK YOU Chick-fil-a for a much healthier option for our kids! 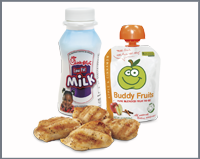 Today,they are introducing a grilled chicken nuggets kid’s meal that comes with fresh fruit or a Buddy Fruits squeezable fruit, and a low-fat milk, 100% apple juice, or water. The chain is changing its children’s beverage line to only feature one percent milk, 100 percent apple juice, its signature freshly squeezed lemonade, and water as drink choices. They are also making improvements to other menu items including reducing sodium and moving away from high fructose corn syrup.